Move over Rooney and Sturridge – these are the pint-sized potential superstars hoping to hit the back of the net in Brazil later this summer. 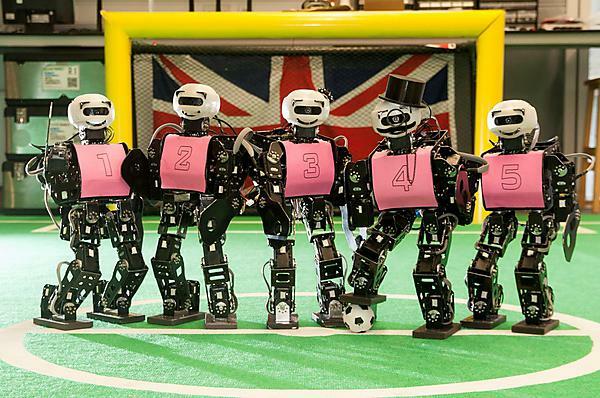 Plymouth University’s robot footballers are currently brushing up on their technical skills before travelling to the Brazilian coastal city of Joao Pessao for Robocup 2014. And as England bow out of their bid for World Cup success, their robot counterparts are hoping to hit the ground running when they arrive in South America next month. Robocup 2014, which begins on July 21, will see some of the world’s leading robotics teams – including representatives from the United States, Japan, China and Europe – competing across seven different leagues. The Plymouth Humanoids team, and its five-strong squad of ‘Drake’ robots, will compete in the Humanoid League and is one of just three teams from the UK participating across the whole event. We have some fantastic new additions to the robots for 2014, and are heading to Brazil with the realistic ambition of at least finishing in the top 10. The University’s ‘Drake’ robots have undergone a series of upgrades since appearing at Robocup 2013 in Eindhoven, in the Netherlands, the most notable being that they can now communicate with each other during games using WiFi. There have also been technical and software developments – including all-player tracking, a new inertial motion unit and a new gait design – intended to further improve the team’s passing and goal-scoring abilities. The first RoboCup was held in 1997 with the goal of “developing by 2050 a Robot Soccer team capable of winning against the human team champion of the FIFA World Cup”. Over the past 15 years, the event has expanded to include categories for rescue (robots and simulation), @Home (for assistive robots in home environments), and @Work (industrial environments), as well as RoboCupJunior leagues for young students.